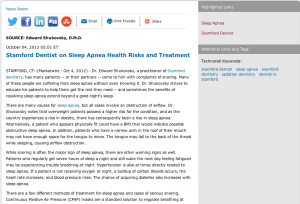 Stamford, CT – Dr. Edward Shukovsky, a practitioner of Stamford dentistry, has many patients – or their partners – come to him with complaints of snoring. Many of these people are suffering from sleep apnea without even knowing it. Dr. Shukovsky strives to educate his patients to help them get the rest they need – and sometimes the benefits of resolving sleep apnea extend beyond a good night’s sleep. There are many causes for sleep apnea, but all cases involve an obstruction of airflow. Dr. Shukovsky notes that overweight patients possess a higher risk for the condition, and as the country experiences a rise in obesity, there has consequently been a rise in sleep apnea. Alternatively, a patient who appears physically fit could have a BMI that would indicate possible obstructive sleep apnea. In addition, patients who have a narrow arch in the roof of their mouth may not have enough space for the tongue to move. The tongue may fall to the back of the throat while sleeping, causing airflow obstruction. While snoring is often the major sign of sleep apnea, there are other warning signs as well. Patients who regularly get seven hours of sleep a night and still wake the next day feeling fatigued may be experiencing trouble breathing at night. Hypertension is also at times directly related to sleep apnea. If a patient is not receiving oxygen at night, a buildup of carbon dioxide occurs, the heart rate increases, and blood pressure rises. The chance of acquiring diabetes also increases with sleep apnea. There are a few different methods of treatment for sleep apnea and cases of serious snoring. Continuous Positive Air Pressure (CPAP) masks are a standard solution to regulate breathing at night. However, Dr. Shukovsky has noticed many patients have a negative reaction to the CPAP. In the past, the medical community has rejected any solution other than the CPAP but that stance is shifting. Dr. Shukovsky suggests as an alternative an oral appliance called a Mandibular Advancement Device (MAD). This oral appliance has the distinct advantages of being much smaller and the device does not require electricity. Dr. Edward Shukovsky, a graduate of the University of Pennsylvania School of Dental Medicine has attended cosmetic dentistry programs from the Hornbrook Group as well as the Aesthetic Masters. He continues to stay abreast of the latest dental technologies and techniques for the benefit of his patients. He leads the Dental Practice of Edward Shukovsky, D.M.D. in Stamford, Connecticut and is affiliated with a range of accredited dental organizations. In addition to sleep apnea treatment, Dr. Shukovsky provides other advanced dental options such as sedation dentistry for patients suffering from anxiety over dental procedures, and TMJ treatment to correct jaw pain and migraines associated with dental health.